Like many of the characters in John Cassavetes' films, Sarah Lawson (Gena Rowlands, Cassavetes' wife) is all impulse and no filter. To want or to need is to act immediately on that desire with no thought given to context or to consequences. In an early scene in “Love Streams” (1984), poor Sarah cannot even keep her thoughts to herself for the few minutes needed to get through a divorce hearing; the sympathetic judge about to grant her custody of her daughter has second thoughts when Sarah begins rambling about her fondness for attending funerals along with a barely-formed plan to relocate. Sarah's act of self-sabotage is a daily occurrence, the sort that makes the people around her (as well as the film's viewers) cringe in embarrassment and also sigh with exasperation. She leaves the kind of mess that requires everyone else either constantly to clean up in her wake or to abandon her completely, the latter choice rendered more difficult by the fact that Sarah refuses to abandon anyone, certainly not her family. For her, love is “a stream – it's continuous” and she's fully prepared to drown if need be. Los Angeles-based writer Robert Harmon (John Cassavetes) lives out loud too, but he's fashioned a responsibility-free life that enables him to do so without judgment. It also helps to be a man. The film offers an implicit commentary about gender inequality by contrasting the fate of these two peas-in-a-pod. Where Sarah has been institutionalized and labeled an irresponsible mother, similar impetuous behavior merely marks Robert as an eccentric whose bluster and faux-machismo are just part of the bachelor artist's lifestyle. While Sarah must see a psychologist, Robert, who almost always clutching either drink or a cigarette (or both), is free to spend his nights on the town or servicing the harem that takes up temporary residence in his home (the real-life home of Cassavetes and Rowlands) . The unexpected arrival of a son he abandoned before birth causes only the slightest ripple in Robert's “stream” and it surprises nobody that the boy's first full day with dad ends with tears. Robert feels deeply and sincerely guilty about it, at least until he can drive away and put the experience behind him. About an hour into the movie, Sarah and Robert finally meet up. It is a long-delayed reunion, but their relationship is not specified until much later so I won't spoil it here. These two volatile personalities simultaneously spend the second half of the movie alternately clinging to and careening off of each other. Robert's instinctive response on seeing Sarah for the first time in years is to crush her in a bear hug, but just moments later he spontaneously decides to take a trip to Las Vegas and leaves her alone in the house. This caprice makes perfect sense to Sarah who thinks nothing of calling a cab simply to take her... somewhere. The specific destination will reveal itself whenever it does. A bowling alley? Sure, why not a bowling alley? To say the least, Sarah lives in the moment and Gena Rowlands' intense, fully invested performance has won many admirers. In an excellent feature included on this Criterion disc, critic Sheila O'Malley explains the appeal of the performance, noting that Rowlands treats the stakes in every single scene “as if her life depended on it.” She does not merely want, she wants so desperately she will do anything to achieve her goal, whether it involves trying to bowl a strike, choosing a pet, or convincing her daughter and husband to return to her. Acting for Rowlands here is not being, but doing. Sarah always rolls her eyes or clutches her hair or bites her lip as she rockets from crisis to crisis, and her only way of dialing it down is by literally passing out. It's an energy Rowlands somehow maintained in just about every John Cassavetes film in which she appeared. For all these reasons, Rowlands' collaborations with her husband have been embraced by fans as some the most-beloved performances ever committed to screen. While I can appreciate this, it is also for the same reasons that I have difficulty with them. Histrionic personalities drain the life right out of me. I'd like to think I'd be more sympathetic in real life, but when it comes to make-believe, I don't feel quite as obliged to endure the very trying experience. 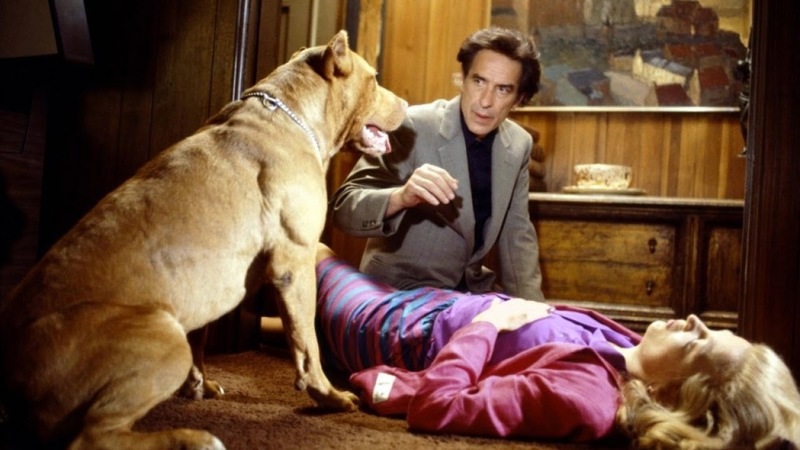 Cassavetes' frantic, pure id characters have always felt like aliens to me, and I have always been puzzled by critics who describe them as some of the most authentic, naturalistic performances ever rendered. But there is no such thing as a universal experience and we all live in a world of small sample sizes. What Rowlands and Cassavetes (his Robert is only slightly more restrained than Sarah) achieve here is impressive for its sheer force of will and its sustained ferocity, but it's not suited to my taste. I'll return to O'Malley's insightful commentary again. Talking about Rowlands' performance in “A Woman Under The Influence” (1974), O'Malley describes it as Cassavetes' indictment of those who “recoil from human beings who (are) 'too much. '” I accept my indictment. I recoil. 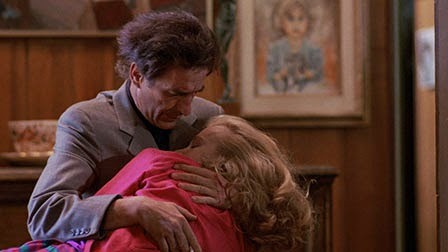 “Love Streams” was the last true John Cassavetes' film, marking the end of a career that completely reshaped the landscape of American independent film. It's also the final chapter of one of the most memorable director-actress collaborations ever. The film is presented in its original 1.85:1 aspect ratio. 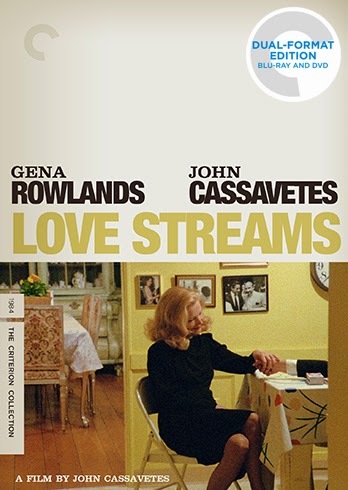 “Love Streams” has been unavailable on a Region 1 DVD until now, which seems like it shouldn't be possible, so any release is welcome but Criterion has, as usual, done a nearly flawless job with this presentation. The 1080p transfer flexes its muscles with exceptional image detail, most noticeable in the many close-ups. In a film that closely observes every tic and gesture and expression, the detail is essential, as is the rich grain structure visible throughout. Colors are full and naturalistic. No problems at all. The linear PCM Mono track is sharp and distortion-free. The lossless audio isn't that dynamic but also isn't meant to be. All dialogue is clearly recorded and the music (original score by Bo Harwood) is well-presented. Optional English subtitles support the English dialogue. Criterion has more than made up for the long-time unavailability of this film on DVD or Blu-ray. The film is accompanied by a new 2014 commentary track by Michael Ventura, author of “Cassavetes Directs.” Ventura had back-stage access to the production and offers plenty of detail here. I've already mentioned the feature “Watching Gena Rowlands” (24 min.) Critic Sheila O'Malley provides an insightful and heartfelt appreciation of Rowlands' work not just in this film, but in all of her work with Cassavetes. If you only have time for one feature on this disc, watch this one. The lengthiest feature is “'I'm Almost Not Crazy' - John Cassavetes: The Man And His Work” (1984, 56 min.) This documentary, directed by Michael Ventura and shot during the making of “Love Streams,” includes interviews with Cassavetes, Rowlands, the recently deceased producer Menahem Golan, write Ted Allan, and others. The “real” Cassavetes is every bit as intense (or “too much”) as the characters he played and the ones he wrote and directed. I have no idea how a person can expend that much energy. The 28-page insert booklet includes an essay by critic Dennis Lim (who included “Love Streams” as one of his Top Ten film in the 2012 “Sight & Sound” poll) and a piece on the film by John Cassavetes that was originally published in the New York Times on Aug 19, 1984. While it is not a personal favorite, I know that “Love Streams” will finish atop many lists of best Blu-ray releases of 2014, both because it is greatly admired and because it somehow has not been available on Region 1 DVD until now. Criterion has provided an excellent transfer and a stacked roster of extra features that should please any fan.